With the MTA set to raise fares 4 percent over the next two years, it’s time for the bi-annual spectacle of fare hike hearings, where political appointees absorb the brunt of straphanger anger so Governor Cuomo doesn’t have to. This time around, the proposed increase in fares isn’t that big — a larger hike was in the works until the MTA’s short-term financial outlook took a turn for the better. But unless Albany closes the gap in the MTA capital program, future fare hikes are going to look a whole lot worse. 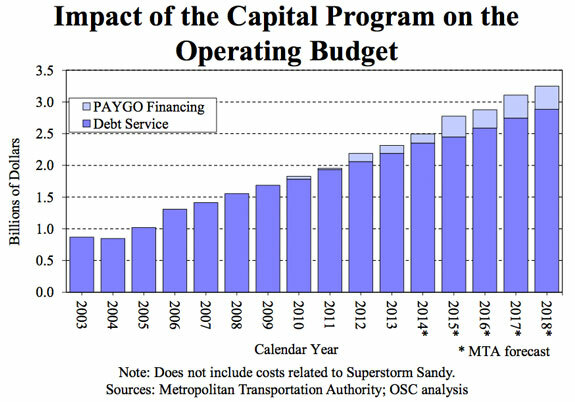 Every dollar that the MTA has to borrow will end up costing transit riders down the line, as the agency devotes an increasing share of its operating budget to debt service. In their testimony, the Straphangers Campaign and the Riders Alliance urged riders to take their complaints to Cuomo. The governor, more than anyone, has the power to raise revenue and contain costs to keep the MTA’s debt at manageable levels. So far, though, Cuomo has shown nothing but an aversion to dealing with the $15 billion gap in the agency’s next five-year capital program. If Cuomo fails to close the gap, transit riders will be looking at much more than a 4 percent fare hike. After taking on $15 billion in additional debt, the MTA would be saddled with interest payments that equate to a 15 percent fare hike, according to an October report from State Comptroller Thomas DiNapoli [PDF]. That’s more than three times the size of the current increase. The commission is a pointless spectacle. The governor deliberately rammed through less-than-prudent contract renewals with the unions in the run-up to the election. That squandered an opportunity to a least control costs with relatively little labor attrition. The NYS sales tax on gasoline is capped at 8 cents a gallon, which was 4% of $2/gallon when the cap was legislated. If gas was taxed like shoes or toothpaste, it would raise about $450m in annual revenue, which could finance about $6B in capital projects. Less well known is the impact of the operating budget on the capital program. For years if there was any excuse to make an operating cost “reimbursable” by the capital program, it was done. This still goes on. Just check out “reimbursable” operating expenses in the MTA budget. They were once just operating expenses. 1) “Reimbursable operating costs, so federal money and borrowing could support the MTA operating budget back door. 2) Having the state sell the Thruway to the Thruway Authority, which borrowed money to buy it. One reasons there is no money for the Tappan Zee. 3) Raiding money from the Transportation Trust Fund they had just created (for roads), and then borrowing to do the road work (almost all the motor vehicle revenues are going to debt now). 4) Canceling a plan to buy new subway and rail cars a little each year on an ongoing basis as a case expense. Cuomo lost to Pataki in 1994, and Pataki, Bruno and Silver introduced the more advanced practice of selling off the future every when the economy was booming and tax revenues were rolling in, and then doing it ever more in recessions. So when will I stop harping on the deals and non-decisions our political crowd, many still there, made 20 years ago? Perhaps when they stop making similar deals and non-decisions. Perhaps when my unborn grandchildren stop getting sacrificed to pay for them. Perhaps when we actually START paying for some of those deals, rather than digging the hole deeper. You’re right, John, but only in a narrow/technical sense. NYS’s effective gas tax is 50 cents/gal (see http://taxfoundation.org/blog/map-state-gasoline-tax-rates-2014), when you count the state excise tax plus the PMT (dedicated to the MTA, as you know). And even if it’s true that a full sales tax on gas would raise $450M/y — I haven’t checked that figure — politically nearly all of that would have to go for highways, and mostly upstate, since the vast majority would be raised outside of the MTA tax district. There’s a page in my BTA spreadsheet, “Taxes Instead,” quantifying the fatuity and futility of trying to fill the MTA capital plan gap through increases in sales taxes or gas taxes or vehicle reg fees. (Let me know if you want me to feed you the #’s.) Wouldn’t we be better off staying on message w/ the Move NY toll-reform plan and its promise of $1.4B/y in net revenues?